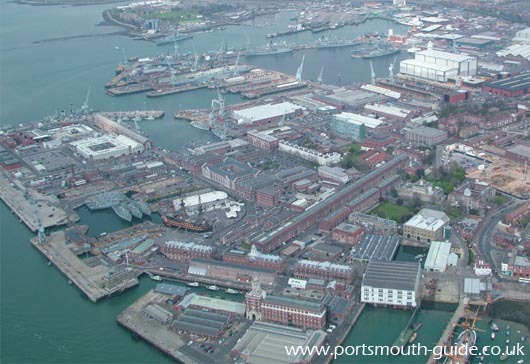 The Royal Navy as can be seen from the above picture of Portsmouth Dockyard still plays an important part in Portsmouth. The dockyard and historic dockyard are next to each other allowing people who visit the historic ships to get a glimpse of the up to date naval ships. There has been a dockyard in Portsmouth since June 1495 when the first dry dock was created in Portsmouth. Portsmouth’s Naval Dockyard is located on the west side of Portsmouth and is home to 60% of the Royal Navy’s surface fleet of ships. The Royal Naval base is 300 acres in size and consists of 62 acres of basins and 15 working dry docks. The historic dockyard is located alongside the Royal Naval base and includes HMS Victory, the Mary Rose, HMS Warrior, the Royal Naval Museum, Action Stations and many other exhibits. In 1194 King Richard I granted Portsmouth its first Royal Charter and also ordered the construction of a dockyard. In 1495 King Henry VII ordered the construction of the world’s first dry dock in Portsmouth and in 1670 Charles II created the Royal Navy and granted Portsmouth the status of Royal Dockyard. Between 1750 and 1850 Portsmouth’s dockyard was at its peak due to the continuous wars. During this period the dockyards storehouses, residences and rope house were built. In 1802 the block mills were opened, this was a factory that mass-produced ship pulley blocks. The block mills used machinery designed by Marc Brunel. During the Second World War Portsmouth became the target of bombing attacks due to its significance of being home to the Royal Navy. In 1984 the Royal Dockyard lost the title of Royal Dockyard and was to be known as a Naval Base. HMY Britannia has had its home since it was built in Portsmouth. To celebrate the 500 anniversary of the first dry dock in Portsmouth the dockyard was opened to the public to visit with opportunities to look at the repair depot, block mills, take a vintage bus ride around the dockyard, look at ships close up and many other events. For more information about the Royal Navy it has its own web site at www.royal-navy.mod.uk it contains a large amount of information from information about the history of the Royal Navy, information about their uniforms, about careers in the navy and information on the Royal Marines. The Royal Navy put on a field gun run every year on Whale Island for the public to see our entry into the Royal Tournament but sadly this event no longer exists. The Navy has always been at the centre of Portsmouth life with Nelson leaving for his last journey on HMS Victory from Portsmouth to go to the battle of Trafalgar. The Royal Naval Museum tells the history of the Navy from the past up to the present day. HMS Victory is the oldest commissioned ship in the world and it is situated in Portsmouth Historic Dockyard. For information about Trafalgar 200 and the International Festival of The Sea 2005 please click here. In 2008 Portsmouth saw the first Meet Your Navy event, more information about that event can be found here and in 2009 the dockyard hosted a Royal Navy Past and Present event.